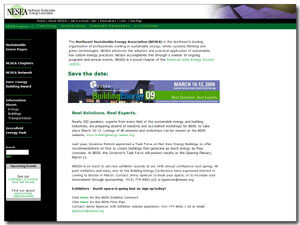 The Northeast Sustainable Energy Association is a leading regional membership organization focused on promoting the understanding, development, and adoption of energy conservation with non-polluting and renewable energy technology. Their programs and activities focus on the northeastern United States, from Washington, DC to Maine. NESEA acts as a hub that connects people across a broad base of interests and disciplines. Their network of active citizens, professionals, businesses, and organizations in the Northeast seeks to discover and demonstrate the responsible production and use of energy. They collaborate and cooperate with allied organizations to advance their common interests. They celebrate, inspire, and nurture visionary ideas, emerging markets, and practical solutions.